Welcome to Canada. We're a land of freedom and democracy. Unless you want to discuss the question of when human life begins. We don't debate abortion. Oh it's not that we're all agreed on abortion. Depending on the polls and the phraseology of the questions, a significant percent of the population disagrees with status-quo - once they are made aware that abortion is legal here throughout all nine months, for any and all reasons, and is paid for by Canadian tax dollars. Since 1988, when the Supreme Court struck down the unevenly applied abortion laws that had been introduced in Prime Minister Trudeau's 1969 Omnibus bill, Canada has remained one of few countries in the world to have absolutely no laws on abortion. Most Canadians don't know this is our dark reality, because we're Canadians - we're polite. We will kill 115,000 preborn boys and girls annually, but please don't ask us to talk about or even question it. We don't do that. When the Supreme Court struck down the faulty laws in 1988, every last one of its judges said that there should be a law governing abortion in Canada, and that it was up to parliament to determine what this law should be. Nearly twenty-five years later, Canadian parliament has remained largely silent on the issue of abortion. A handful of private member's bills have been introduced, (including an unborn victims of violence bill that would have made it a separate crime to kill a woman's wanted fetus in an act of violence against her) but none have ever been moved into law. This year, a private member’s bill (motion 312) was introduced by conservative MP Stephen Woodworth. The bill merely asked that a committee be put into place to study modern prenatal knowledge and re-examine Canada's 400 year-old definition of a human being. 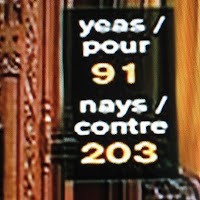 While the motion does not directly address abortion, the findings of such a committee would be of utter importance, due to the fact that the Canadian Charter of Rights grants life and personhood to all human beings. Currently, the Criminal Code of Canada states that a child becomes a human being only at the moment of complete birth. Who needs to study science when we have magical lines like these? The decision hardly comes as a surprise. In fact, it's almost certainly an admission of guilt. Opponents of the bill seem to already know that an inquiry into the science of fetal development will threaten "the right to choose." After all, if supporters of abortion were confident that life began at birth and that nothing new has been added to scientific understanding of human fetal life in 400 years, why should this inquiry frighten them? Parliament is not the only place that refuses to debate abortion in Canada. In 2008, the Canadian Federation of Students, a body that represents all student federations across the country, enacted a pro-choice policy that enables campus student federations to ban pro-life clubs from even existing. One after another, universities from coast to coast have denied and revoked tuition-paying pro-life students their right to assemble as official clubs on campus, while abortion advocates, like Canadian Abortion Rights Action League Joyce Arthur, compare pro-life clubs to "neo-Nazis and white supremacists". Pro-life presentations that do take place are drowned out with shouts or daycare songs (video: St Mary's University in Halifax, video: McGill University in Montreal) or brazenly vandalized (video: University of British Columbia) , with campus police intervening by shutting down the presentation (not the violent protestors) as the source of conflict. Student groups that continue to run pro-life events without the official sanction of their student union, find themselves silenced by formal complaints, and further restricted by official university orders and legal threat. Pro-life students at Carleton University and at the University of Calgary were arrested and charged with trespassing on their own campuses, after violating orders to cease their presentations. (video: Carleton University, video: U of Calgary) This is Canada, where the majority's "right to not be offended" or challenged with an opposing view trumps a minority's right to free speech. At least on this issue. More arrests are made outside of Canada's abortion clinics, where 500 foot bubble-zones in several provinces make it illegal to protest, stand or pray within blocks of an abortion clinic. The elderly Linda Gibbons has spent more than nine years in jail over the past couple decades, for repeatedly standing outside a Toronto clinic with a simple sign featuring a baby and the words: "Why Mom, when I have so much love to give?" Young adult Mary Wagner has also done jail time for interacting with abortion-minded clients or for handing women roses as they entered the clinic. Canadian protestors can stop traffic, get angry, even get violent without necessarily facing charges. The right to protest is a highlight of Canadian democracy! Unless you're asking for fetal rights. That's not cool. Off to jail you go! So welcome to Canada. Please feel free to express yourself here, for we are proud of our diversity. We will boast of Canada as a mosaic, a beautiful blend of cultures, values and beliefs. We will herald our democratic government where we are free to petition our representatives and trust that all our voices will be heard. But please be sure your beliefs tow the majority line and that your views aren't controversial or offensive to anyone else. Because this is Canada. We don't debate abortion here. — John Diefenbaker; 13th Prime Minister of Canada. We have had some victories here in the United States lately. You know how it is with these protests, the police cross a line in the sand and say "if you cross this line you're under arrest" and then the protestor puts thier foot over the line and sticks thier tongue out at the police officer, then the police officer puts them under arrest. And since this is canda, you can bet that the cops weren't even wearing body armor or carrying around military-issue carabines.